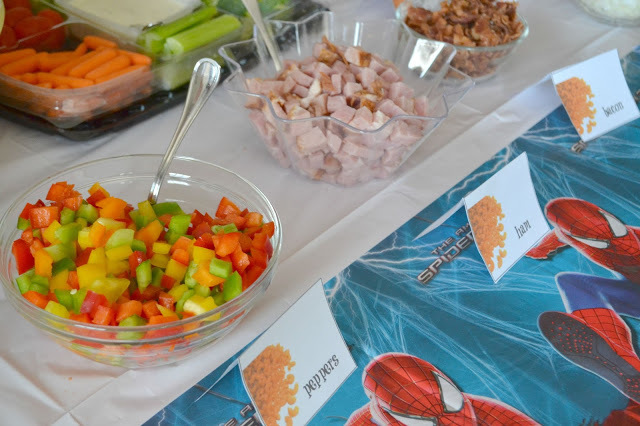 For Jude’s Spider-Man birthday party I decided to get a little creative with the food. Since his parties are always pretty easy to host – always a backyard pool party – I can really focus on the food. 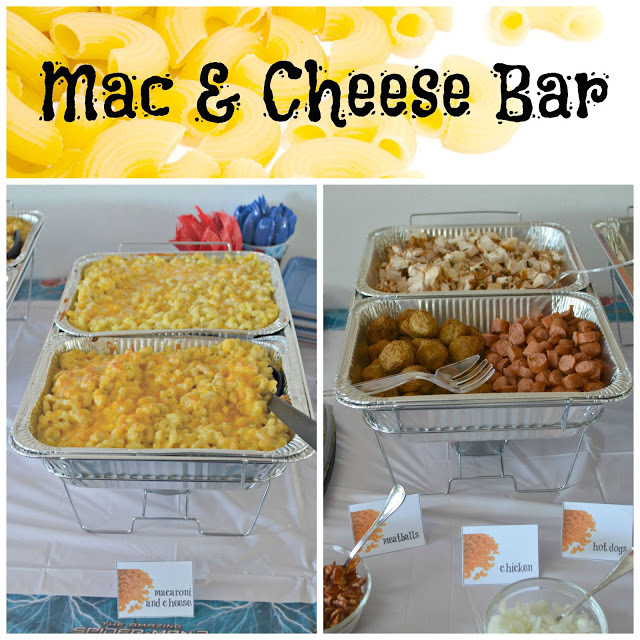 I created a kid heaven with a Mac and Cheese Bar! 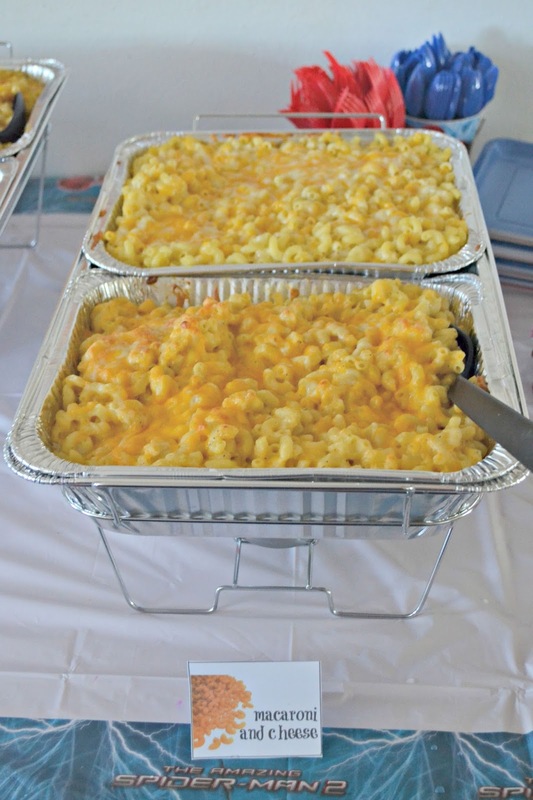 It was a hit – and thanks to my awesome Mother-in-law the homemade Mac and Cheese was adult approved as well! What makes this a Mac and Cheese Bar? The toppings! So many options for guests to choose from. People can literally make their Mac and Cheese custom to their tastes. Yummy! The first thing you have to do is decide what type of Mac and Cheese you will be using. You could easily run to the store and pick up some packaged Mac and Cheese or you can go big and make your own. We decided to use this Mac and Cheese recipe, minus the hot dogs and veggies. It is simple and so good. Comfort food to the max! We prepared 5 pounds (dry noodles) of Mac and Cheese the morning of Jude’s party – while that seems super difficult, this recipe makes it easy. Now for the toppings. Think outside of the box. Mac and Cheese is noodles and cheese – pretty much anything goes with that! Plus…CHEESE makes everything delicious! Most of the toppings we cut and prepared the night before the party just to make the whole set up easier. We used frozen peas, broccoli and corn which made for a really easy way to provide veggies for the kids as well. The kids loved this set up because they got to enjoy a favorite meal and top it with different things that they never thought would go on Mac and Cheese! 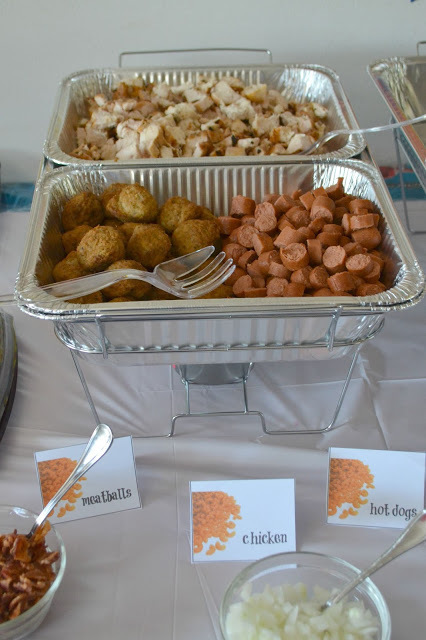 I was so happy to hear all of the complements on the spread – not your typical backyard BBQ but a lunch that is totally kid approved. To make our Mac and Cheese Bar even more festive I created Mac and Cheese Bar Table Tents to place by each topping. I have included these in a file so you can use them too! Super easy way to make your party food look sophisticated and well planned. 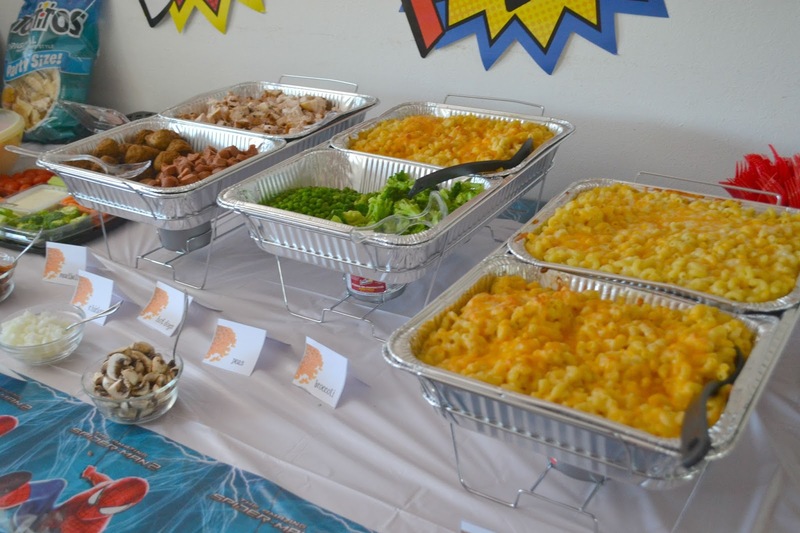 Overall, the Mac and Cheese Bar was a hit and I know I will be using this idea again soon. What toppings would you put on your Mac and Cheese? This is not only a kid's buffet delight – but one for me too! Mac & cheese is my fav comfort food. 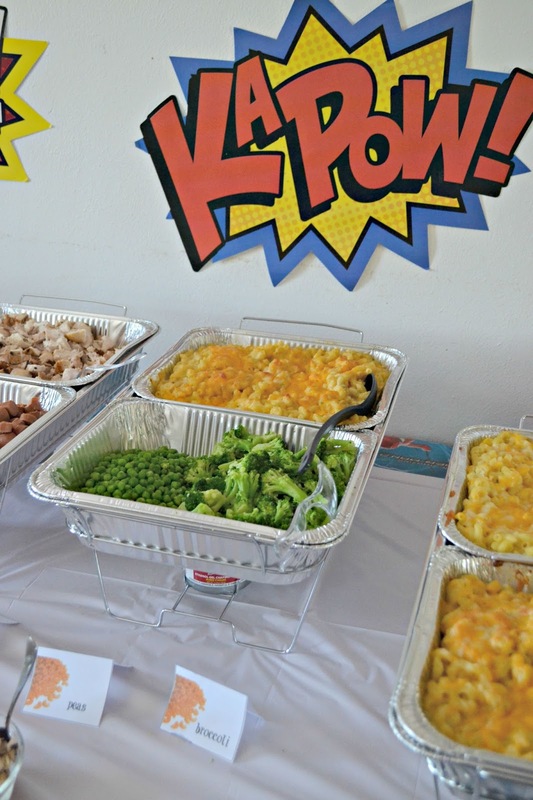 This is a fun idea to do at a kid's birthday party or even a sports tailgate! What a great idea! I'm going to have to steal this idea for our next family get together. This is great for family gathering or birthday parties. I'm definitely going to bookmark this to try it. Talk about a kid's heaven for sure! Wow! I'm a Mac N' Cheese fan too so I woulda had fun pigging out on that. Great job on the party mama! I saw this pinned on Pinterest and I had to check it out. 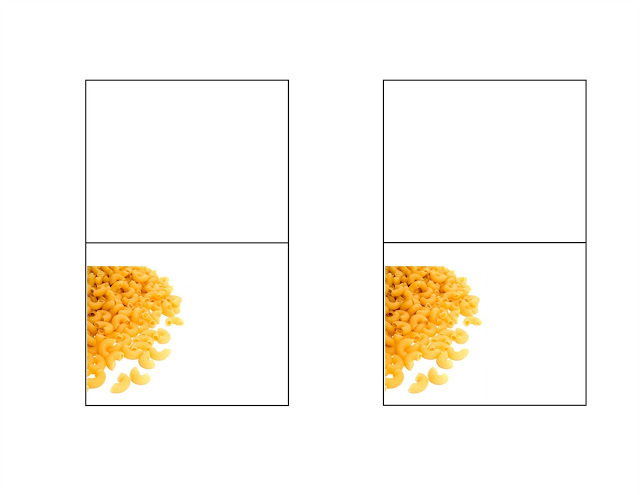 Mac N Cheese is one of our favorite foods and I've just got to try to create a bar.